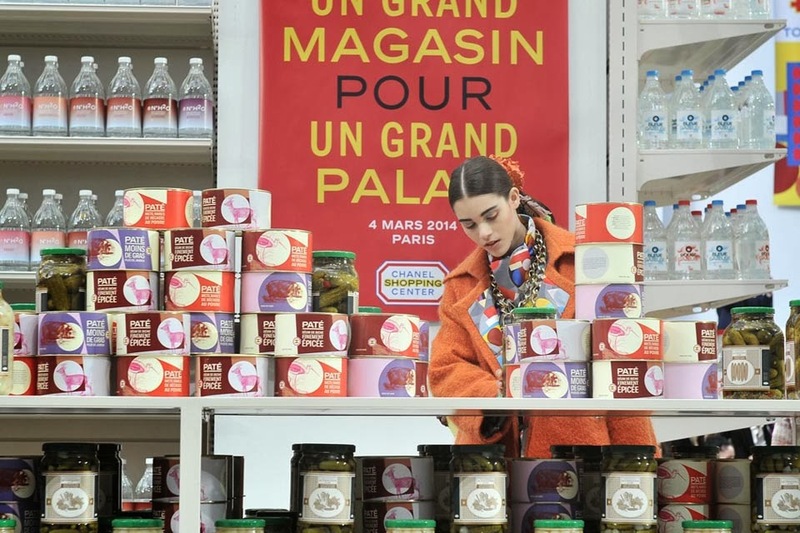 What did Suzy Menkes say to Cara Develvigne at the Grand Palais? Want some Lait du Coco with those Coco Pops? 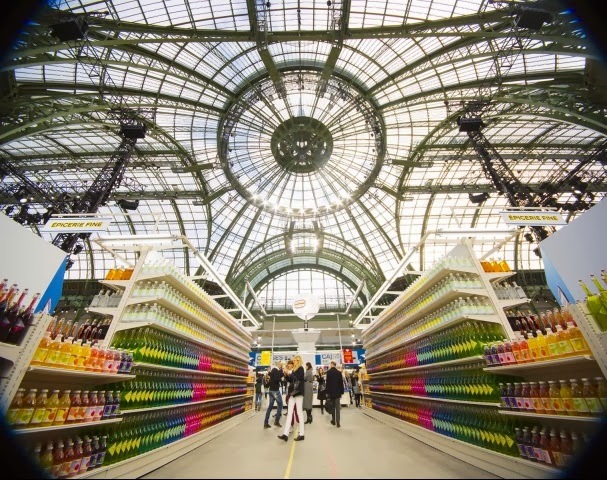 Karl has seriously out done himself with the setting of his Fall 2014 collection this Paris Fashion Week, transforming the main hall of Paris’ iconic Grand Palais into an entire Supermarket (which should be named Karl-mart). 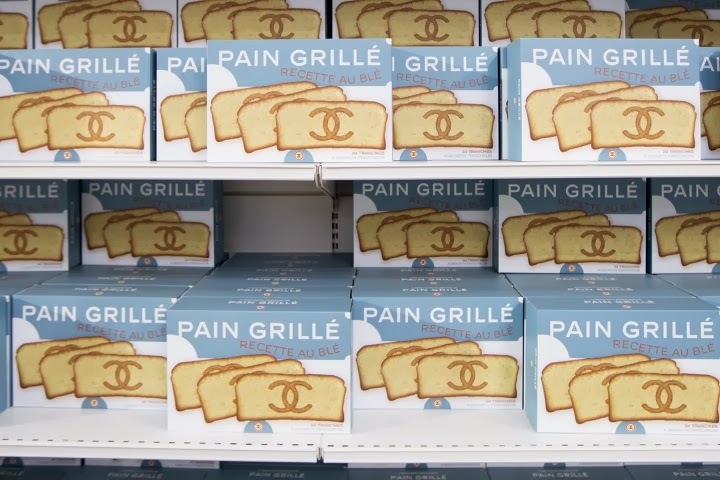 Of course Karl never does anything in half measures, this supermarket had it all: a fruits and vegetable section, canned goods, a liquor isle, and a home improvement department all in witty clever packaging. Products – conjured up by Stéfan Lubrina – included fit aid kits, “Boite a Bobos de Coco”, “Boy” hair mousse for men with the tag line “pour rasage peau d’humeur sauvage” and the “So Chic” beaux ballets, naturally the bottled water “Eau du Chanel” took the audience by storm, but it was the Chanel chainsaw that really stole the show with the iconic leather and chain strap of a Chanel bag as the teeth of the not-so-dangerous power tool. Okay okay enough of the set. 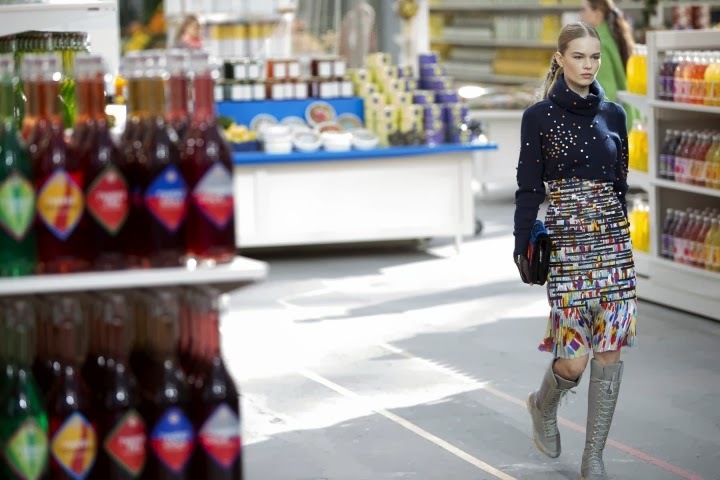 This collection was an extension of this couture show earlier this year with the same hourglass feminine silhouette, this time mixed with brightly coloured and metallic tweeds, sweatpants and of course those Chanel sneakers which were extremely welcomed by fans of the house after his show in January. This time taking it a step further and also introducing the low top lace up boot which will no doubt be on many an A-lister’s foot in a matter of weeks. 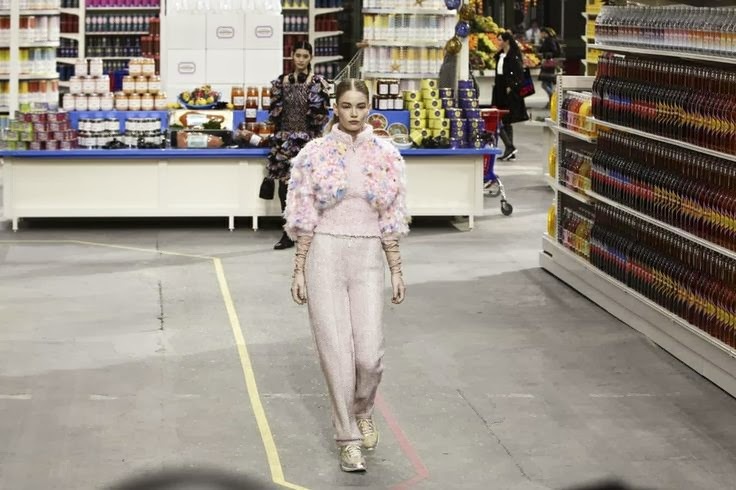 Adding onto the sporty casual vibe as seen in his last few RTW collections, Lagerfeld adds yet another layer of urban cool with slouchy sweatpants, hole filled knitwear and iridescent leggings. So now it’s safe to say that the accessories department had a great deal of fun with the collection. 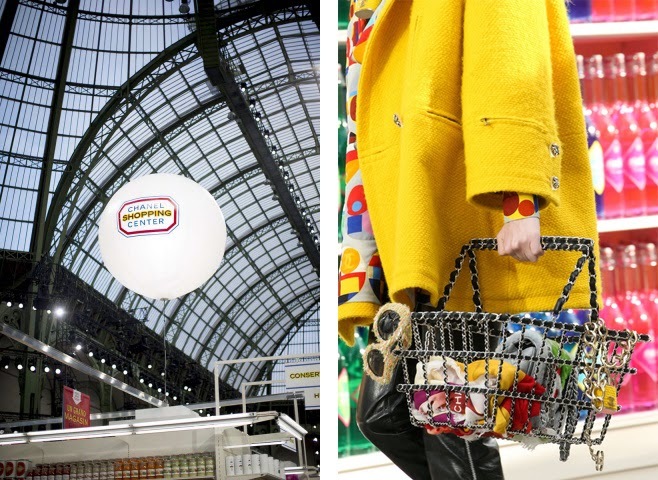 Chain metal shopping baskets were crafted from iconic Chanel leather and chain straps and the wheeled shoppers were aptly quilted, whilst fun touches including Chanel candy necklaces and the plastic wrap purse were all delightfully inventive. “Why a supermarket? 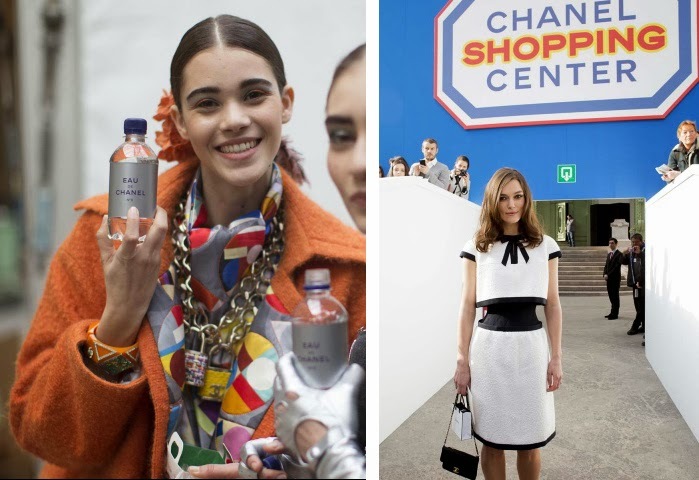 It is something of today’s life and even people who dress at Chanel go there — it’s a modern statement for expensive things,” said Largerfeld. 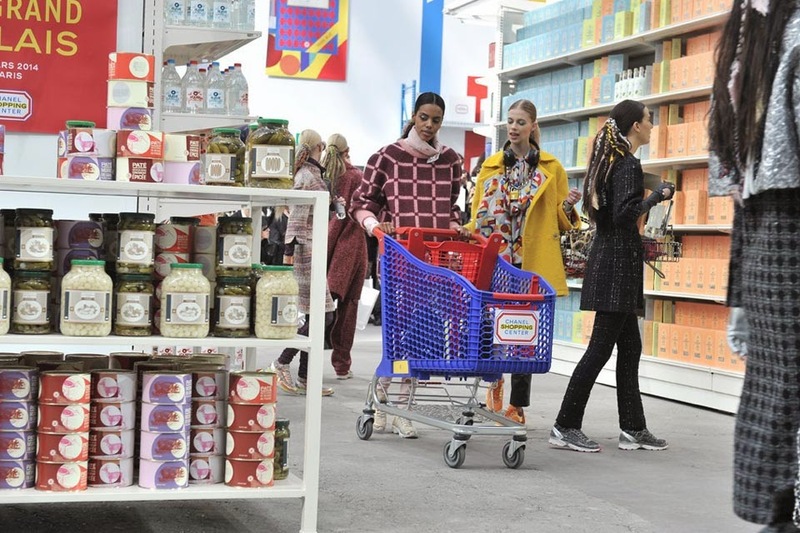 This collection was a real Supermarket Sweep for Chanel.